Prepare to immerse yourself in a land between times and dimensions, an LPMud based on a city that allows entry into any number of timelines. 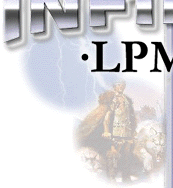 Infinity LPMud provides willing adventurers and questseekers with a venue of original ideas, mindboggling quests, and bloodcurdling beasts, spinning into realms of power, magic, and technology, and many players with which to share your adventures. Comments, suggestions, and ideas may be sent to infinity@infinitymud.com. 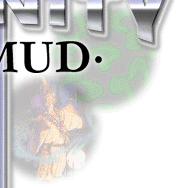 To look around the game itself, telnet to infinitymud.com 4242. The winner of our website logo contest is Warlord. Congratulations for your excellent work on our logo! The image for the "Wizard Information" link is courtesy of Thomas Abrahamsson, and is copyrighted by him. This image may not be used without his express prior consent. We thank him for his generosity in allowing us to use it for our home page. There is no longer a "text only" version of our site, due to the versatility of current text browsers and the abundance of free graphical ones. If you need a graphical browser, try Firefox or Chrome.